The Shrine of Our Lady of Good Year (Santuari de Nostra Senyora de Bonany / Santuario de Nuestra Señora de Bonany) sits on top of Puig de Bonany in the center of the island of Majorca. 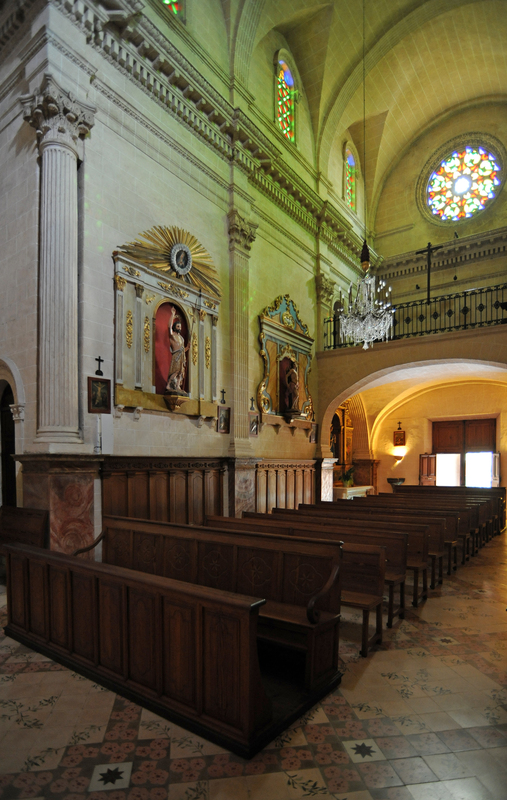 The sanctuary of Bonany is also called "Hermitage of Bonany" because from 1896 hermits settled there guarding the shrine. The name "Bonany" sometimes spelled "Bon Any" means "Happy New Year". In 1609, a severe drought threatened crops, the inhabitants of Petra went in procession to the top of Puig de Maria, which was venerated statue of the Virgin Mary to implore to bring rain. Their prayers were answered and heavy rain made ​​it possible to have a good harvest (bon anyana) this year. In popular tradition, it happened in 1600, not 1609. 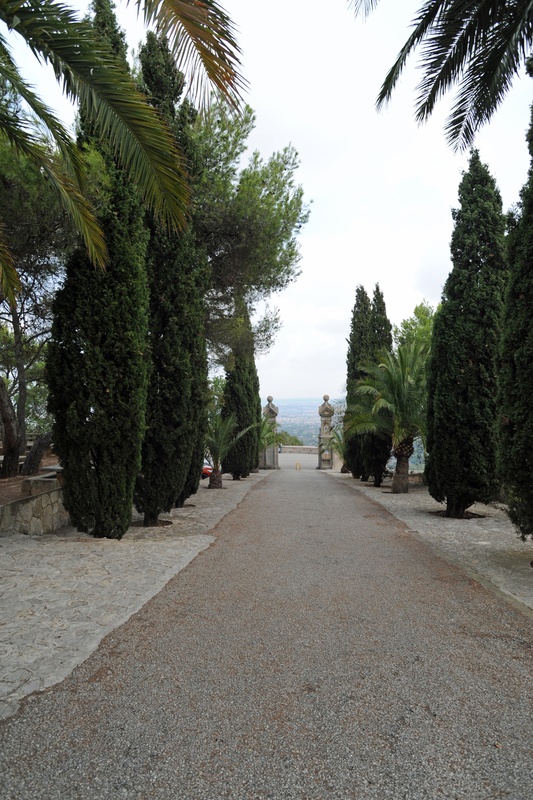 Since then, the Puig de Maria is named Puig de Bonany, and the statue of the Virgin, the Mare de Déu de Bonany, Our Lady of Good Year. 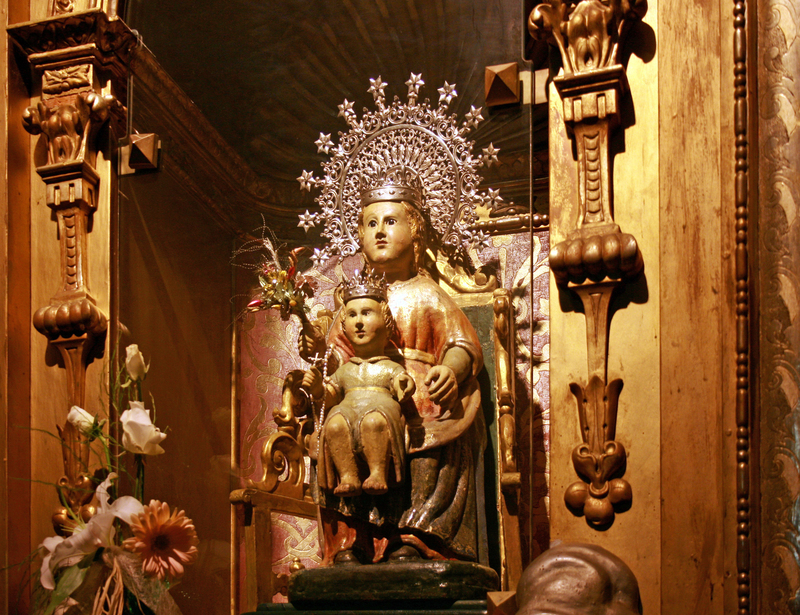 In gratitude, the population built a Marian shrine instead of the original chapel. The sanctuary of Bonany is at the top of Puig de Bonany, a hill 317 m above sea level, but visible from afar since the plain of Mallorca (Es Pla de Mallorca). The Mount of Bonany is located almost at the same distance from the cities of Petra, northeast of Vilafranca de Bonany the south, and Sant Joan, in the west. Access to Puig de Bonany is from Petra by a small road, 4 km in length, which is right (Carrer de Bonany), on the southern outskirts of the city, on the road Ma-3310 towards Felanitx. 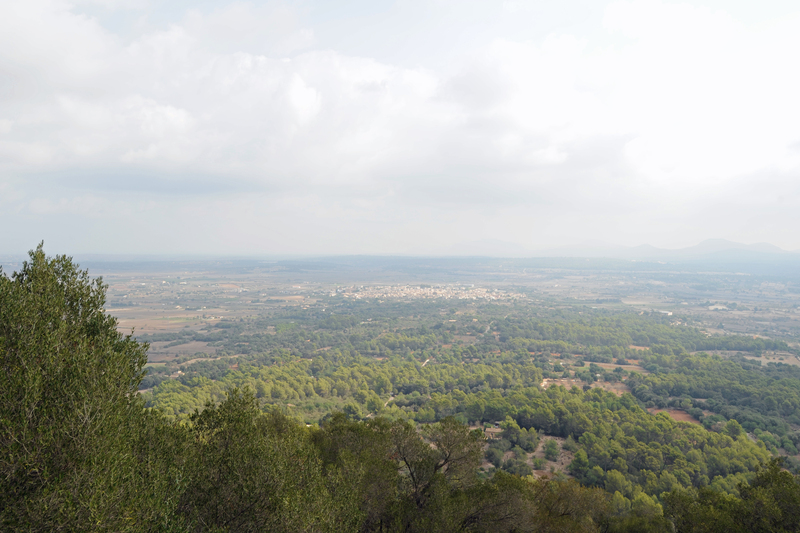 Geographic coordinates (parking Sanctuary): 39º 35’ 42’’ N ; 3° 5’ 15’’ E.
From the car park there is a beautiful view of the north and north-east of Mallorca, with Petra in the foreground, from the terrace of the sanctuary, the view to the north-west to the coast of Pollença and of Alcúdia. The terrace is a place to picnic, with tables, much appreciated by the locals. Shortly before arriving at the sanctuary, the visitor passes a stone cross commemorating the last sermon by Brother Juníper Serra in Bonany. The Franciscan Junipero Serra was born in Petra, in 1749, he was sent on a mission to Mexico, where he evangelized California. This stone cross was erected on Easter Tuesday 1949, on the occasion of the celebration of the second centenary of the start of Juníper Serra, in the place where 200 years ago he left the inhabitants of Petra. 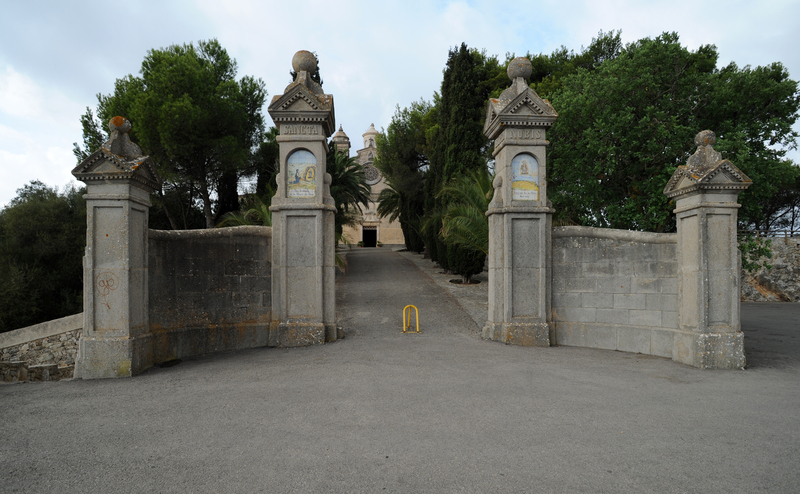 From the parking lot, one enters the sanctuary through a gate whose pillars are two panels of tiles bearing the inscriptions: on the left, "Sa trobada de la Mare de Deu" (The discovery of the Virgin), to the right "L’any 1600 fou per Petra Bon any" (The year 1600 was a good year for Petra). 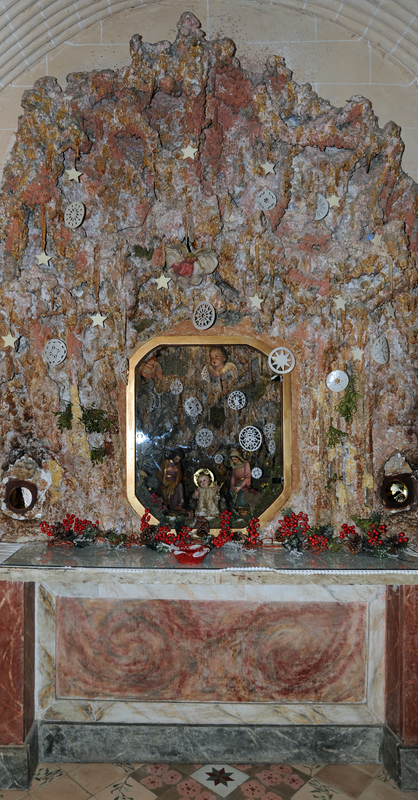 The pillars of the portal are also decorated with panels of painted tiles (azulejos) depicting St. Anthony and St. Paul, the patron saints of the Congregation of Hermits who spoke sanctuary Bonany during the twentieth century. 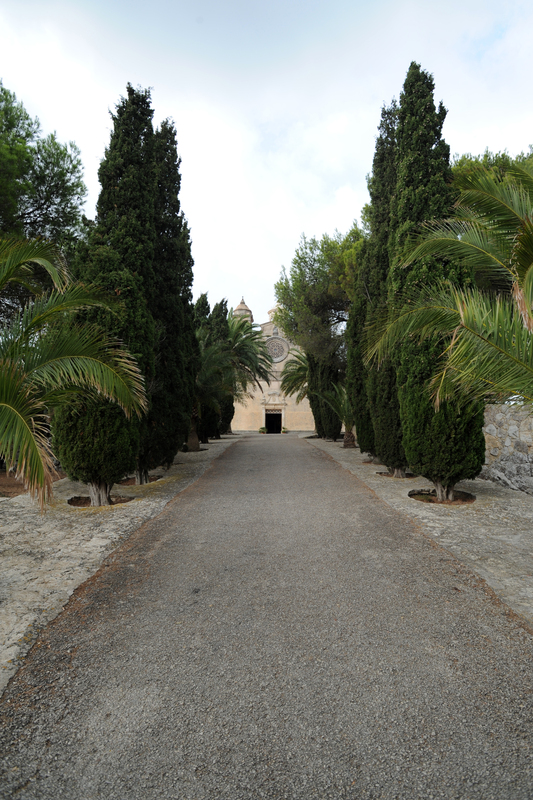 An avenue lined with cypress and palm trees leads to the sanctuary. 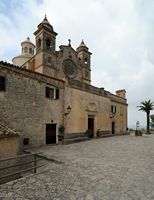 The sanctuary consists of a church and houses, which were inhabited by hermits, and now serve cottages. On the right side of the terrace stands the well of the old tank at the octagonal rim, which water has refreshed pilgrims Bonany for generations. 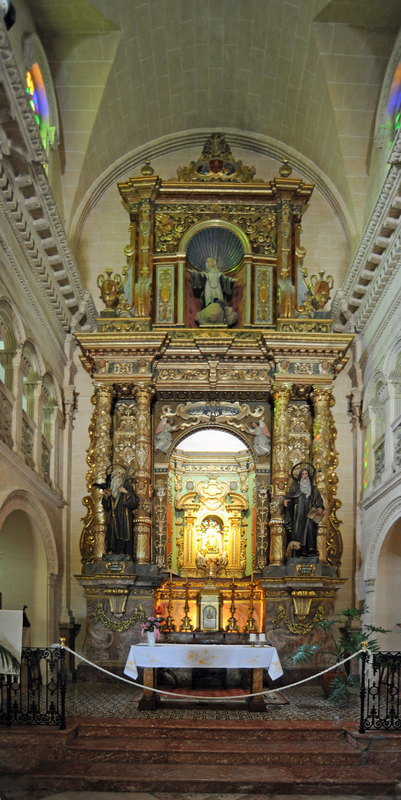 A small chapel existed in the early seventeenth century (1604) on top of Puig de Maria, the chapel housed a statue of the Virgin (Mare de Deu), which - according to a pious tradition - was hidden in a cave for the occupation Muslim and was rediscovered after the Christian reconquest by the Catalans. 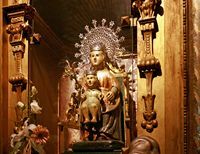 After the Virgin had heard the prayers of the people of Petra that she might save crops from drought in 1609, a small shrine was built at the initiative of the priest of Petra, Father Miquel Vicens. The seventeenth and eighteenth century the shrine had restorations and expansions resulting in a mixture of styles. In 1697 - as recalled by an inscription - the chapel was enlarged. In 1789, the gate was rebuilt, it is the only element of the first sanctuary that is still in place in today’s church above the lintel of the portal you can see the emblems of Petra (the papal tiara and keys St. Peter) with the date 1789. On the back of the church, which is exposed to the sun, there are two sundials, one in 1710, plaster and badly damaged, and the other in 1799, in sandstone. 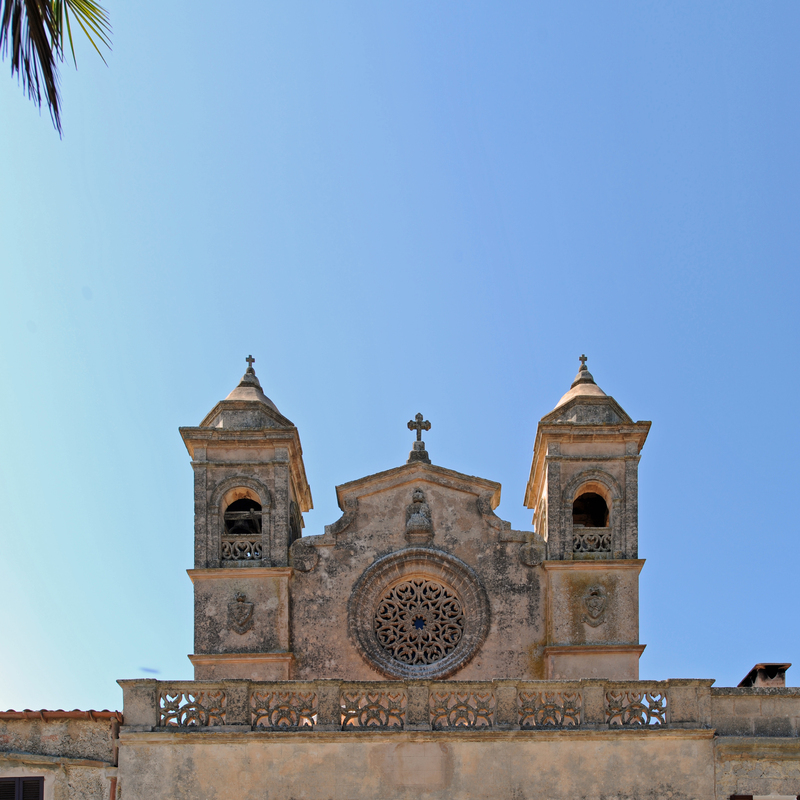 In 1919, the roof of the church was destroyed by lightning. Rather than repair, it was decided to build a larger church building extending backwards to the southwest. The reconstruction began in 1920 and was completed in 1925, with the fervent participation of the people of Petra, Vilafranca and Sant Joan. This is the reconstruction of 1920 dates the current appearance of the sanctuary, inspired by the Renaissance and Classicism. 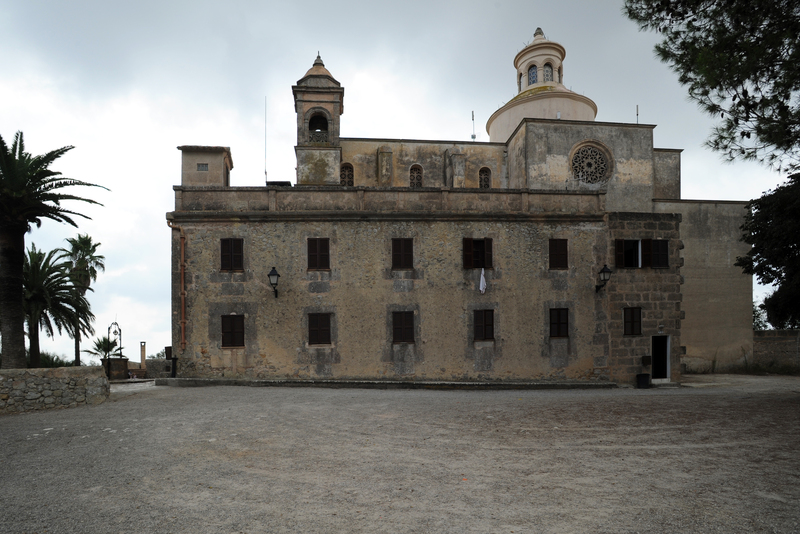 The dominant building material was sandstone Mallorca (marès), but also, on occasion, the concrete. 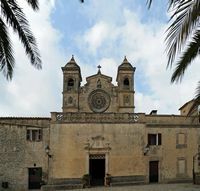 The facade of the temple is surmounted by a pediment decorated with a rosette of stone on both sides, square towers surmounted by cupolas octagonal frame the pediment. Under the porch is a plaque commemorating the wishes of the Blessed Catalina del Carme "Dia 15 d’Octubre de l’any 1925 professa perpetuament en aquest santuari la beata Catalina del Carme Caldés, Socias F.F.M. 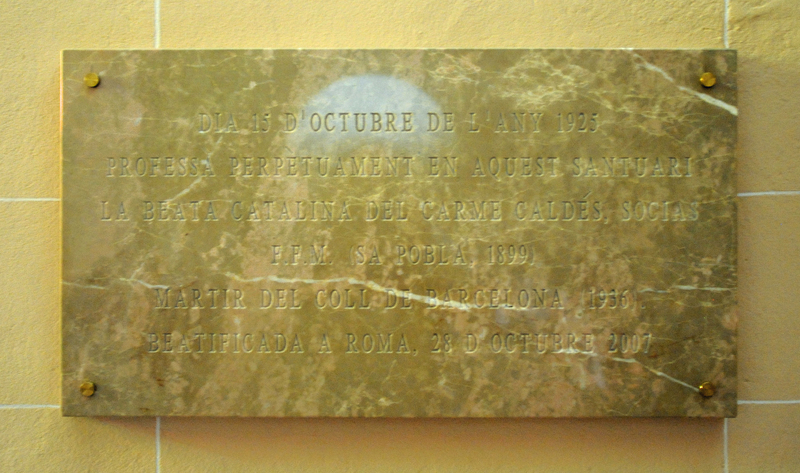 (Sa Pobla 1899) martir del coll de Barcelona 1936, beatificada a Roma, 28 d’Octubre 2007" (October 15, 1925 his perpetual vows in the sanctuary, the Blessed Catalina del Carme Caldés Socias (Sa Pobla, 1899) martyr cervical Barcelona in 1936, beatified in Rome on October 28, 2007). Daughter of a poor family, but very religious, Catalina Caldés Socias (Sa Pobla, July 9, 1899 - Barcelona, ​​23 July 1936) was a sister of the Franciscan Sisters Daughters of Mercy. It was in Barcelona at the outbreak of the civil war with other religious, she was arrested and suffered martyrdom in the district of Coll al Tibidabo, then was shot by "Republicans" militias in Vall d’Hebron, July 23 1936. She was beatified by the Catholic Church October 28, 2007, under the pontificate of Pope Benedict XVI. Another plaque affixed in 1971, commemorates the 75th anniversary of the arrival Bonany in 1896, hermits of the Congregation of Hermits of St. Paul and St. Anthony. 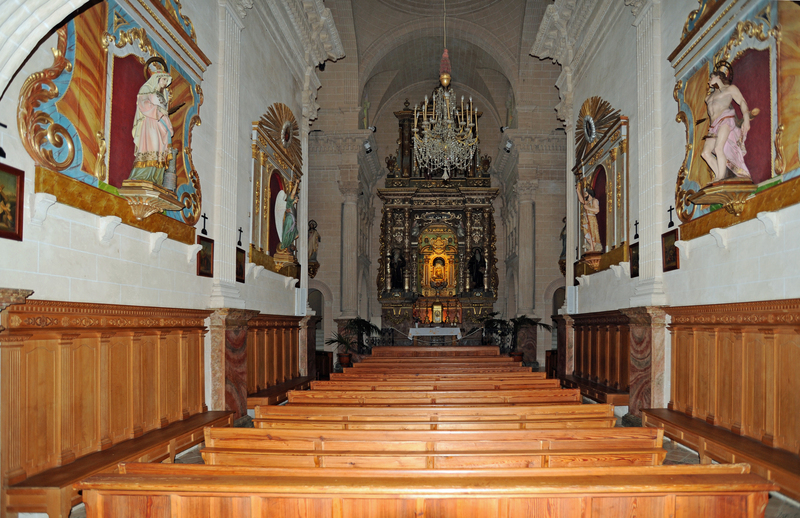 The new church has a wide nave Bonany 25 m long and 6 m wide, with side chapels. 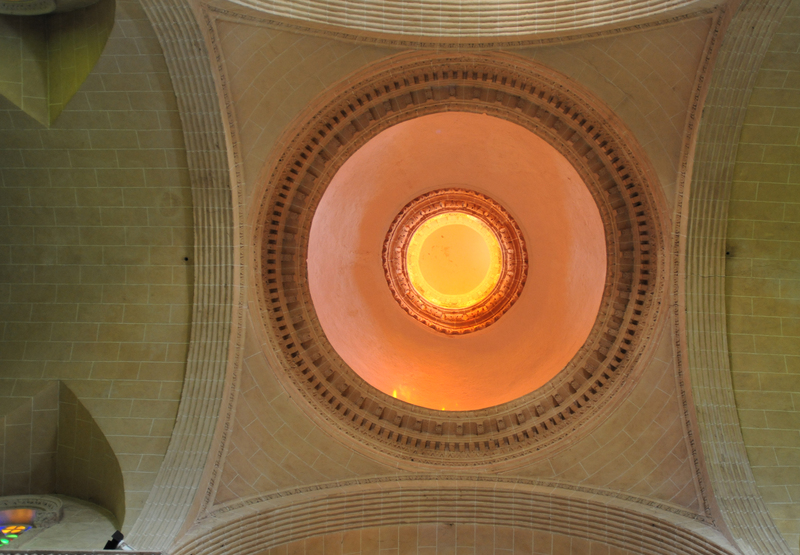 The plan of the nave is a Latin cross, with three sections before the transept, separated by arches supporting a barrel vault of 12 m in height. 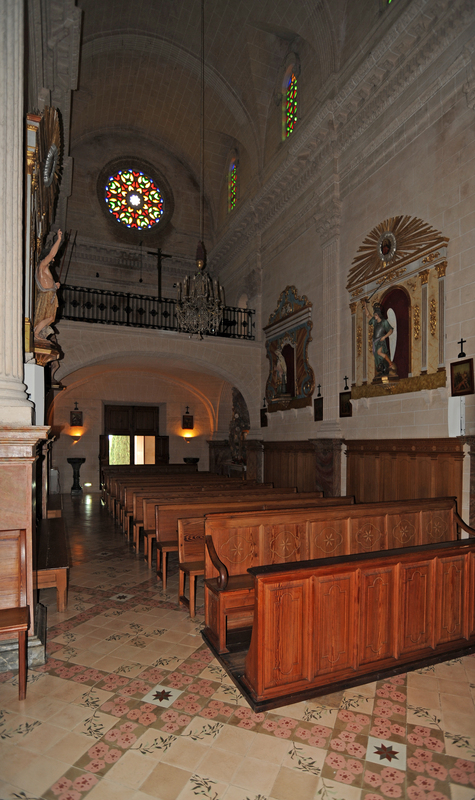 The windows of the nave and the transept roses, made of colored glass, give the site a lot of light. The floor of the nave is covered with a tiled plant decoration, with pink and red flowers, green branches and white stars. 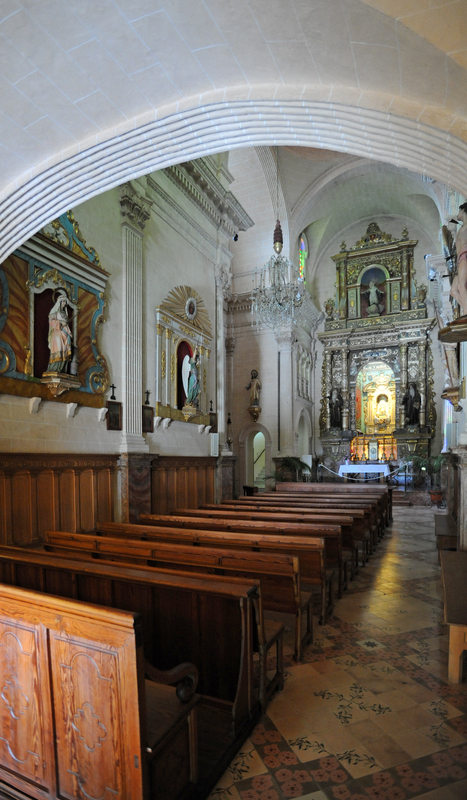 Because of its size and the richness of its decoration, the sanctuary of Bonany is nicknamed the "Cathedral of the Mountain" (Catedral de la Muntanya / Catedral de la Montaña). To the left of the entrance is a manger diorama. 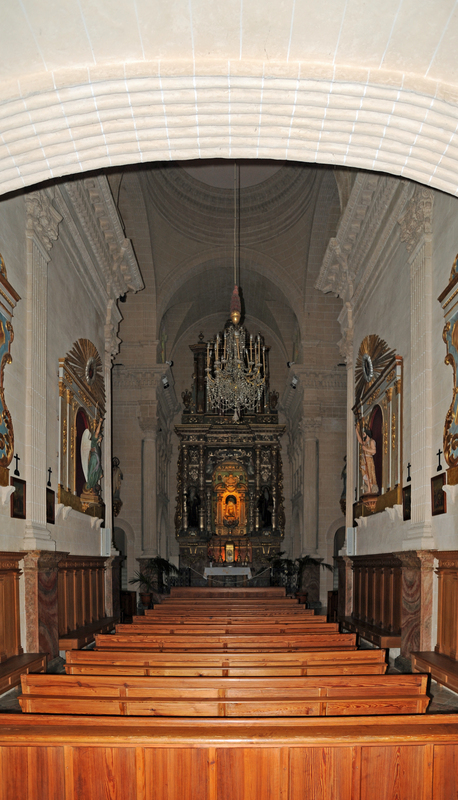 At each end of the transept is an altar surmounted by a rose colored glass. 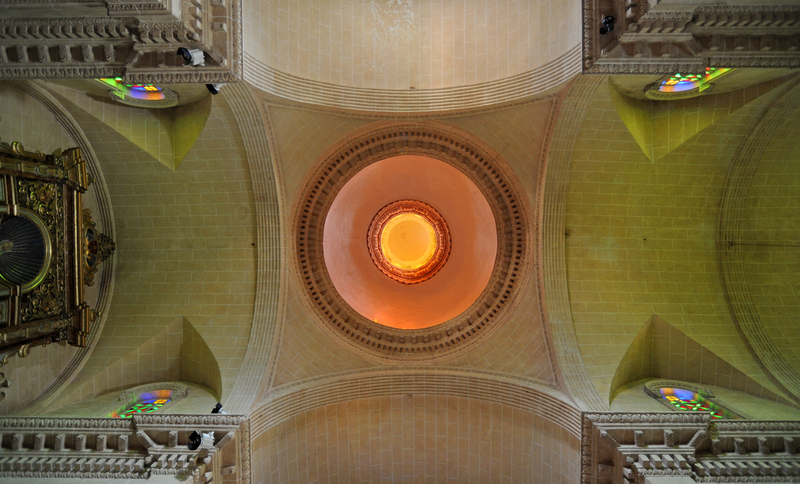 The four corners of the transept are fine fluted columns with capitals elaborately carved, supporting a dome 18 meters high (24 m high outside, counting the height of the cross). 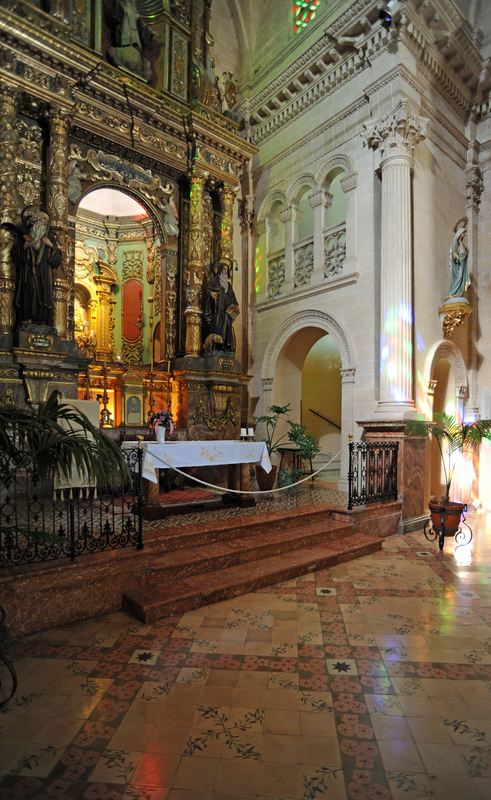 Since the transept stairs provide access to the walkway where you can see the statue of the Virgin of Bonany. 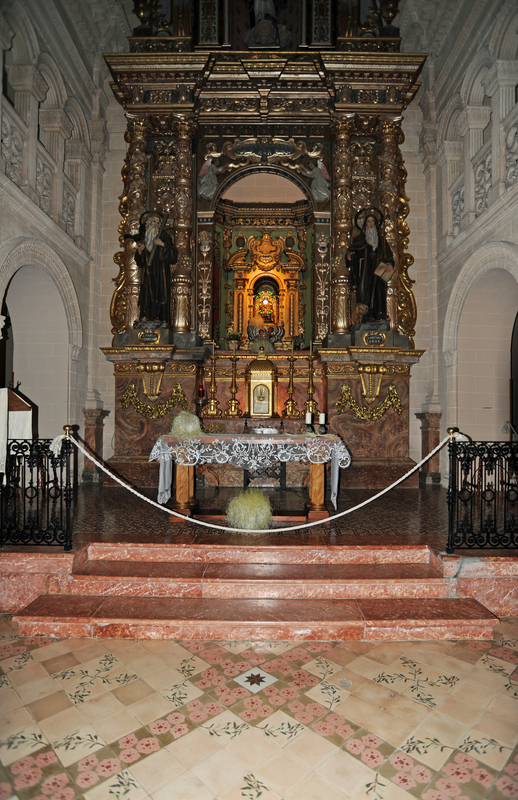 On the sides of the altar, behind the altar, are statues of St. Paul of Thebes (San Pablo el Ermitaño), with a bird on his right shoulder, and St. Anthony Abbot (San Antonio Abad), with a pig at his feet. 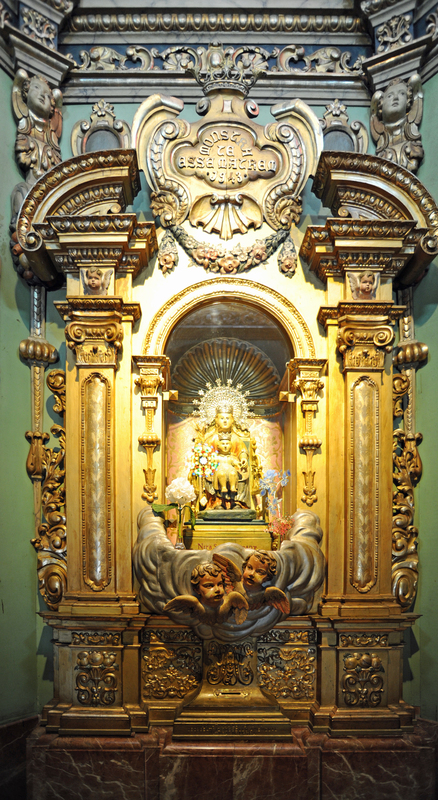 Behind the altar, in a niche which is accessed by a walkway, is the effigy of Our Lady of Bonany. According to legend, this wooden statue dates from the eighth century and was hidden in a cave during the Moorish occupation of the island of Mallorca. A shepherd would have discovered in the cave, after the reconquest almost Fonteta de la Mare de Deu. The style of the object rather suggests a work from the early seventeenth century. The statue depicts the Virgin Mary with Jesus on her lap. Easter Tuesday, the faithful of the surrounding villages make the pilgrimage to the shrine to worship Nostra Senyora Bonany. 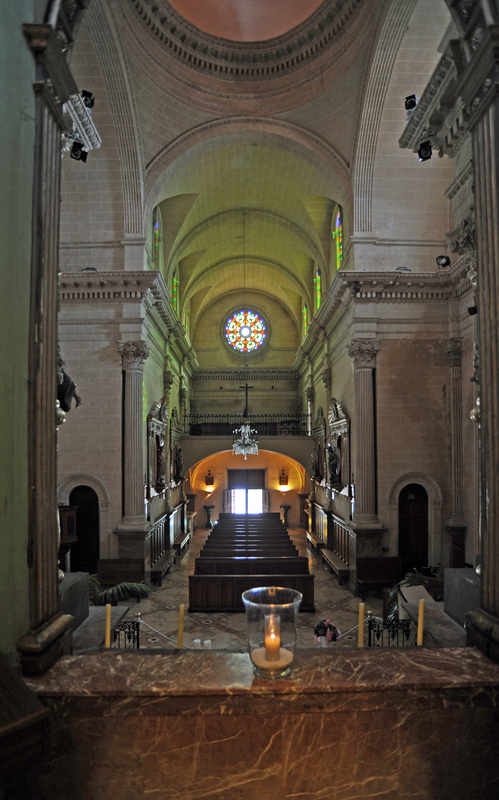 In the nineteenth century the sanctuary of Bonany deteriorated and required constantly restoration. 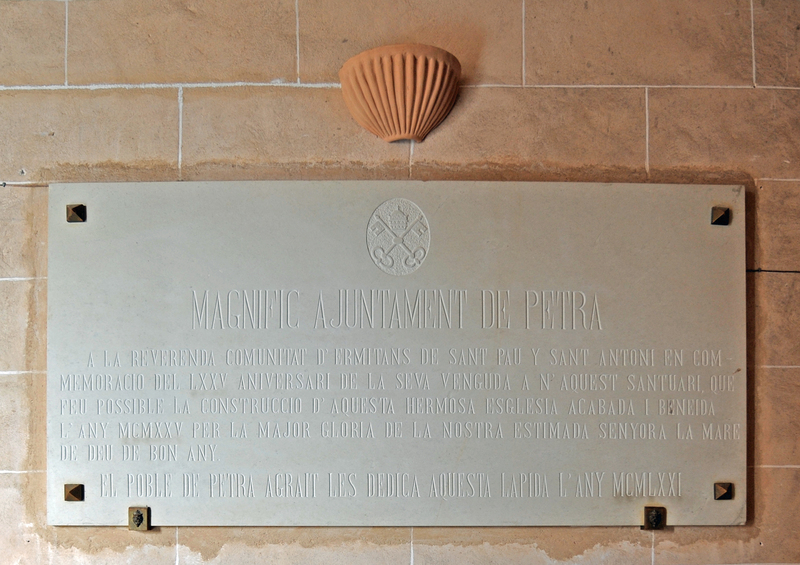 In 1895, the municipality of Petra renounced his rights to the sanctuary and gave it to the bishop of Mallorca. 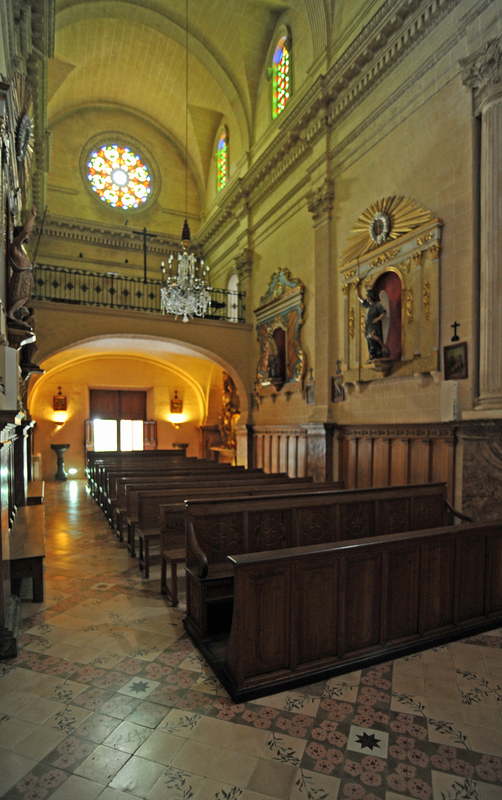 The bishop decided to entrust the care of the sanctuary to the Congregation of Hermits of St. Paul and St. Anthony (Congregació d’Ermitans de Sant Pau i Sant Antoni). The hermit monks settled in Bonany from February 3, 1896. Six cells, a kitchen and a dining hall were built to the right of the chapel. 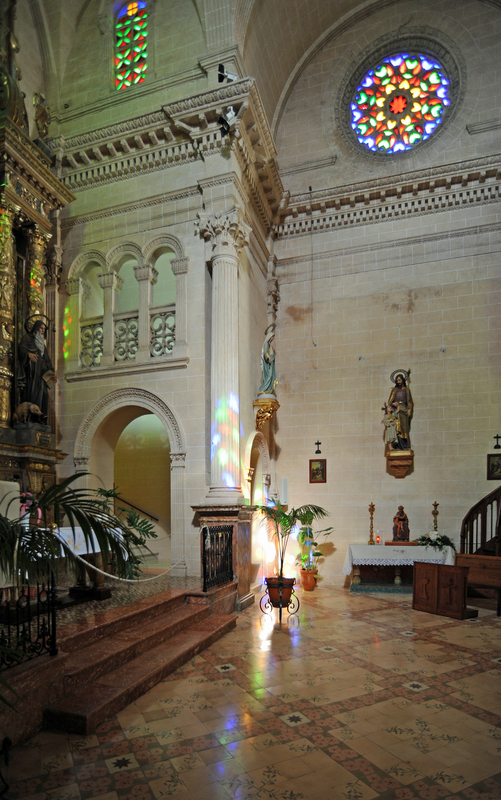 Since then the temple is named Hermitage of Our Lady of Bonany (Ermita de Nostra Senyora de Bonany / Ermita de Nuestra Señora de Bonany). 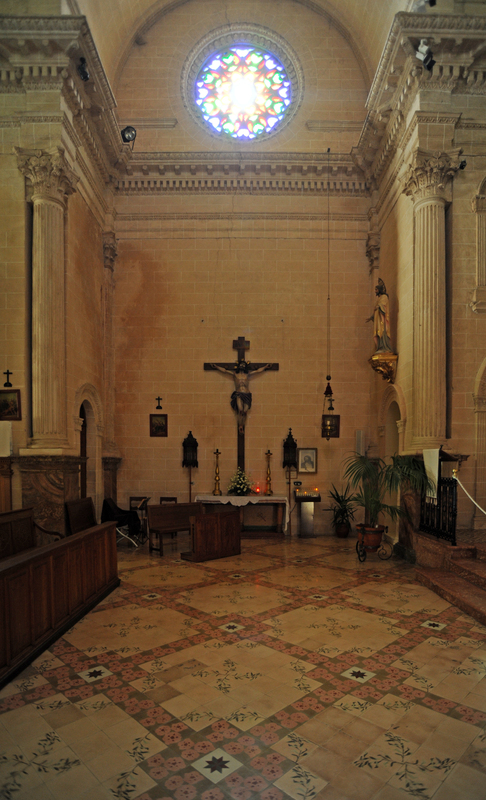 In 1920, the hermits organized the reconstruction of the church we see today. In 1991, the last aging monks left the hermitage. 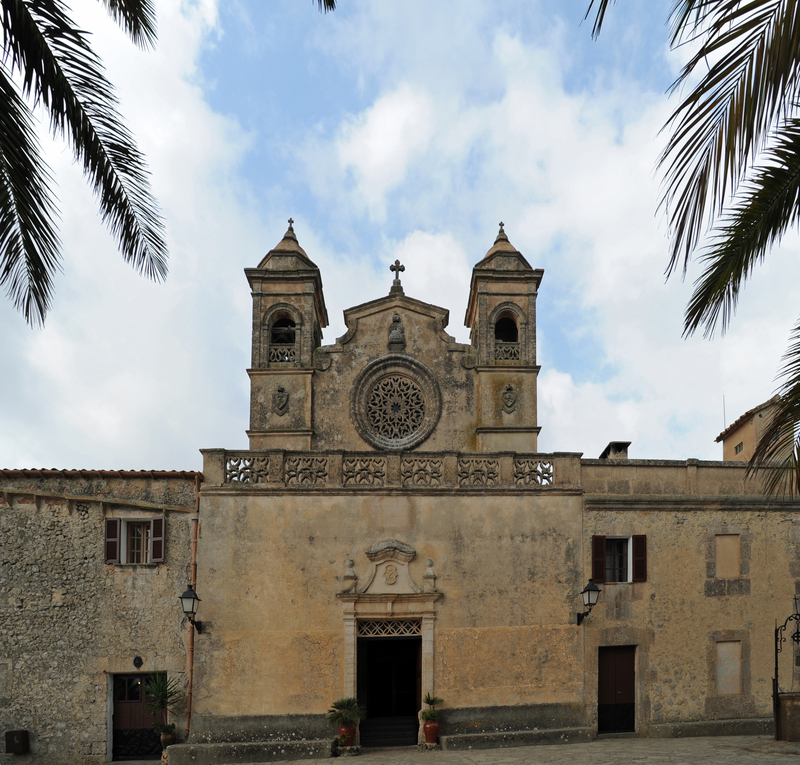 Bonany is one of the six monasteries of the island of Majorca to accommodate travelers, with sanctuaries Lluc of Sant Salvador in Felanitx, of Cura in Randa, of Gràcia in Randa and Monti-sion in Porreres. The sanctuary of Bonany has five double rooms, rudimentary comfort. The five bedrooms share a cold shower and toilet. No restaurant or bar, even less disco, but a kitchen, a dining room, a vending machine and outdoor barbecue areas with picnic tables. 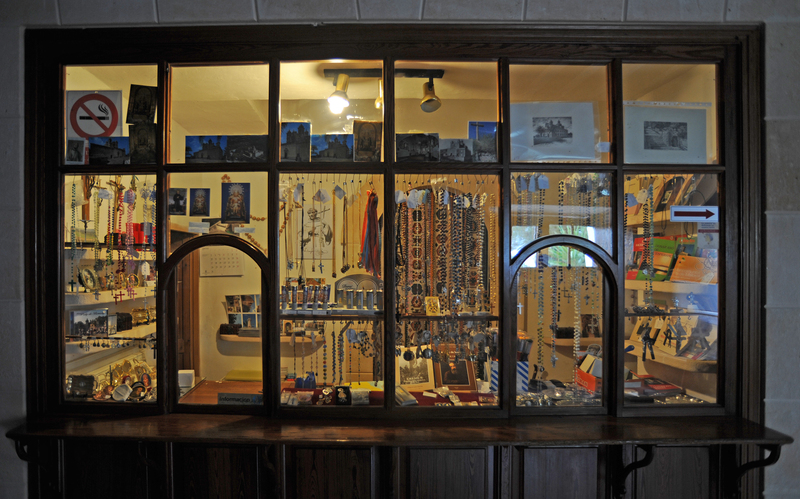 A shop sells religious trinkets. Price: 10 € per night and per person.